I always prefer eating fresh fruit chunks than preparing juices especially when the fruits are oranges and watermelon. If it is to be consumed as fresh fruit I clean it, remove the skin and while dicing them don't bother much to remove the seeds because we have this traditional way of spitting them out, where as while making juices can't leave even a single seed before they go into blender [with a fear that it may turn the juice bitter to taste] and that makes the job bit tedious. But then there are times when this tedious job becomes rewarding - a kiss/ a hug/ a compliment or all of them from my kids. 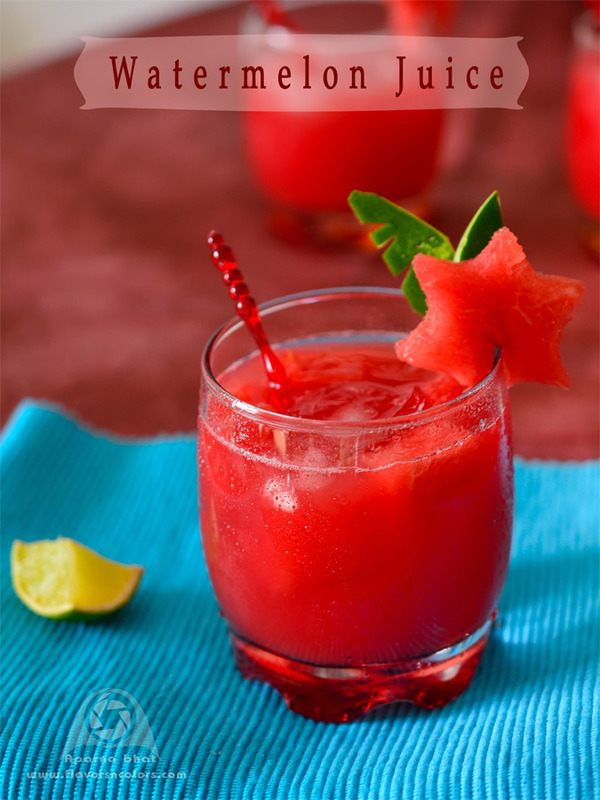 Posting watermelon juice today, yet another refreshing drink. Now there is no need for such an easy recipe but the beautiful enticing red color I had to capture them with my lens and share with all of you. 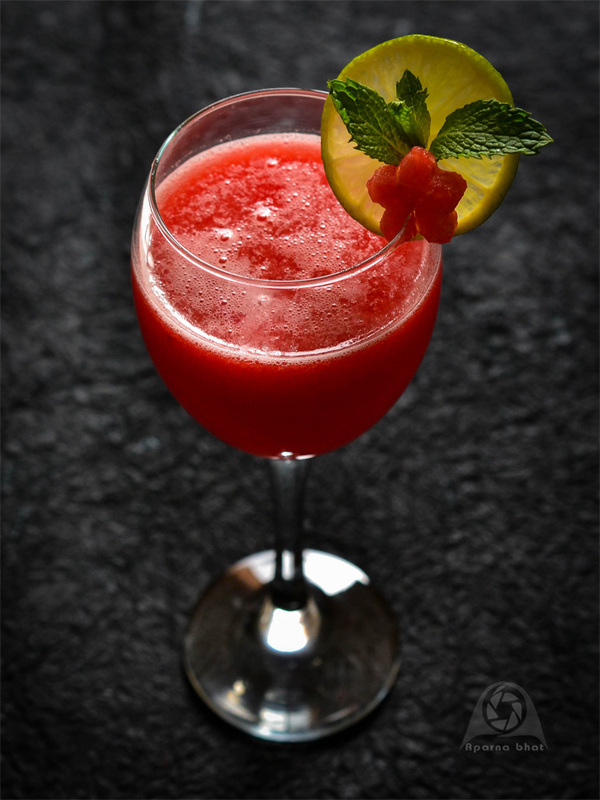 You may have your own preferences while preparing this juice but give a try with the below recipe as variation and quench your thirst this summer. It requires only the fruit and a functioning blender. You may chill the watermelon chunks before putting them into blender. 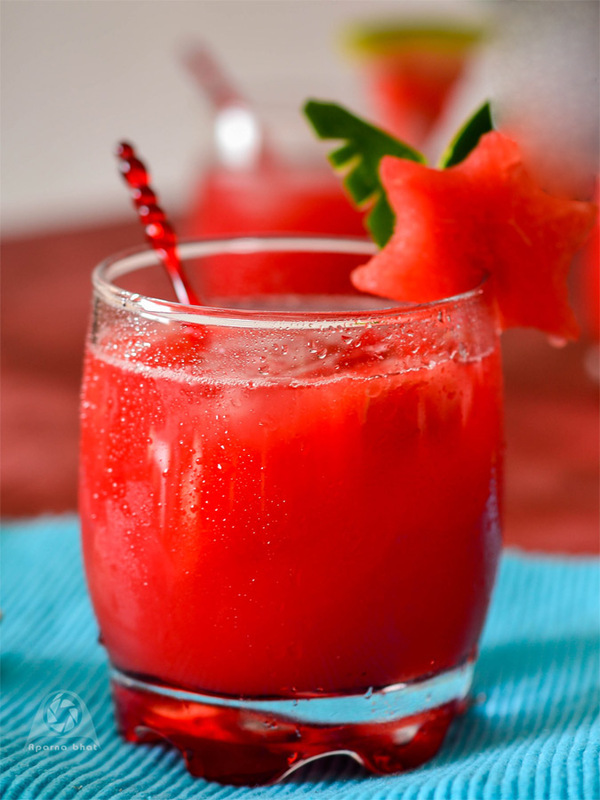 In a blender, take watermelon chunks, add lemon juice and pulse it until smooth. Check the consistency and adjust it with required amount of water. Add sugar, salt, pepper powder. I don't strain the juice and love it with bits of fruit pieces. Pour the juice in glass, garnish if you want with fruit pieces or mint leaves. Serve it chilled or add icecubes before serving. The juice been captured on a different background in the above pic. Served fresh with garnish and no icecubes!